At the ongoing Computex trade show in Taipei, storage vendor SanDisk has launched what it is claiming to be the world’s smallest USB 3.0 flash drive. Dubbed Ultra Fit USB 3.0, the device has a capacity of 128GB, which can store up to 16 hours of Full HD video, the company claims. 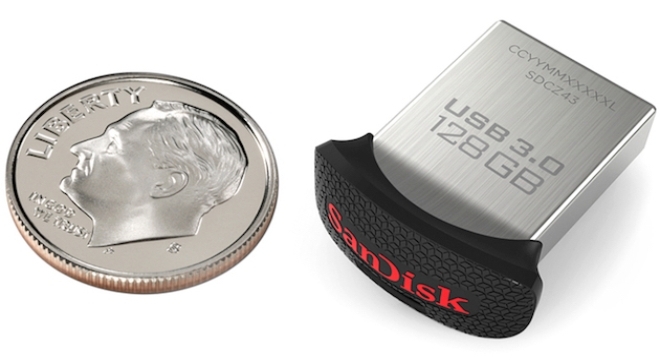 Without its cap, the drive measures 0.75 inch in length, 0.63 inch in width, and 0.35 inch in height, which the company says makes it smaller than a dime. It provides speeds of up to 130MB/s, allowing users to move content up to 10 times faster than with standard USB 2.0 drives, SanDisk claims. “Featuring a low-profile, plug-and-stay design, this tiny flash drive delivers impressive capacity combined with high transfer speeds for media enthusiasts who want to expand storage of their notebook, tablet, TV, in-car audio system, gaming console and more,” the company said in a press release. The flash drive carries a price tag of $120, and is available online and at retailers worldwide.